Movies pitting two popular horror franchises (villains, whatever) against each other have been done before. 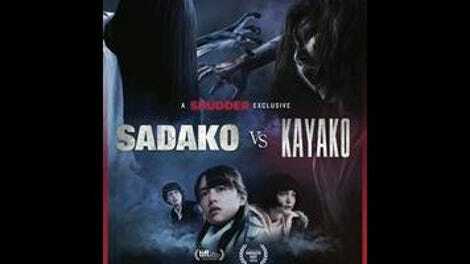 But Sadako Vs. Kayako, a supernatural teen horror movie co-produced by Universal and Kadokawa Pictures, is Japan’s first crack at the phenomenon outside of kaiju movies. For those who have only seen the American remakes, Sadako (a.k.a. Samara) is the creepy girl with the long hair who appears two days (not seven) after you watch the cursed videotape in The Ring movie. And Kayako is the, um, creepy woman with the long hair who haunts the cursed house with her mewling ghost son Toshio in the Ju-On (a.k.a The Grudge) movies. The primary weapon used by both is just kind of standing there looking scary, a plot issue we’ll get to in a bit. Like the producers of Freddy Vs. Jason, the team behind this movie is well aware that the concept of a shared horror-villain universe is very silly. (Promotional stunts for the movie included sheet masks emblazoned with each character’s undead visage and Sadako throwing out the first pitch at a baseball game.) As a result, the tone of the film is light but deadpan, with occasional detours into clichéd ghost-movie suspense and a cheeky irreverence toward authority. As in the Nightmare On Elm Street movies, the grown-ups in Sadako Vs. Kayako are frequently absent and terminally clueless, from the college professor obsessed with Sadako whose “expertise” ends up getting him killed to the parents who say it’s just a coincidence that four little boys were all seen together outside of an abandoned house moments before they disappeared. The only experts with any sort of credibility in the film are stylish demon hunter Kyozo (Masanobu Ando) and his sidekick, a preteen blind psychic. This duo, ripped out of the pages of a comic book and dropped into the film with nary a word of explanation, exists to merge the film’s parallel setups, each one dedicated to one of the respective franchises. The Grudge storyline centers on Suzuka (Tina Tamashiro), a high-school student who moves in next door to a house haunted by Kayako and son. After some local children disappear, she decides to investigate the property herself, dragging her into the supernatural evil that lingers over the place. That storyline hews toward straightforward haunted-house chills, but The Ring aspect of the film is far more comedic. The setup is reminiscent of the ’90s teen slasher Urban Legend. Best friends and roommates Yuri (Mizuki Yamamoto) and Natsumi (Aimi Satsukawa) are currently taking one of those university courses only seen in movies, where it all centers on a professor’s obsession with a particular subject—here, the “late ’90s urban legend” of Sadako—and ends right after he finishes dropping specific expository information. Then Yuri and Natsumi buy a VCR at a thrift store with the infamous “cursed tape” stuck inside, and, after totally freaking themselves out watching it, bring the VCR to their professor for help. Spoiler alert: He’s not much help. Most of the film’s running time is devoted to getting both of these stories to the moment of intersection, at which point all three of our heroines go inside Kayako’s house to watch the tape and summon Sadako. The logic, as explained by Kyozo, is that the two demons will take an immediate dislike to each other and destroy each other on sight, freeing Yuri, Natsumi, and Suzuka from their respective curses. The disappointing part is that, while there’s plenty of eerie atmosphere to be had from two ghost girls lurking in the shadows, the characters provide significantly less to work with in an action scene. So while director Kôji Shiraishi continues to raise the stakes of their confrontation, ultimately to cosmic levels, Sadako Vs. Kayako ends up coming up rather short in the “Vs.” department. Still, for fans of Japanese horror looking for popcorn entertainment, or for fans of Western horror looking for something different-yet-familiar, it’s worth indulging your curiosity for 98 minutes.